Welcome to the 14th edition of the Limit Theory Fan Contest! This month will be about "travel". It doesn't necessarily have to focus completely on travel, but it must openly feature the topic in some form. Be a little creative, and I'm sure you can come up with something awesome. Everyone can make as many admissions as they like, but only one can be the "official" admission by which you are judged. The contest will be open to new submissions until Tuesday, May 2nd, 23:59 GMT. it all starts with a single photonic pulse. travelling down a photonic conduit towards an innocuous control node. the pulse cascades through the node, multiplying, spreading, racing towards sensor clusters. sensors gripping outwards into the fabric of space, testing it, probing it, extracting information. slotting numbers into prepared formulas, estoteric methods being applied on the results, methods long beyond human understanding. interpreting, refining, distilling the data to ever higher degrees. distilling out ways to bend reality to their master's will. pulses racing out to force field arrays, gripping onto rings of exotic matter, setting them into motion and deforming them in subtle, very precise ways. exotic fields pushing and pulling in directions nobody can point in. a hole in the universe opening up. the devices pulling the fabric of the universe around the ship. a mite moving under the carpet. mechanisms pulling reality shut behind themself. fabric being stitched, hole's being patched. the ship is gone from space, racing towards its goal. all that remains is a flash of light. Last edited by Cornflakes_91 on Wed Apr 05, 2017 1:59 pm, edited 1 time in total. As soon as they entered the hyperspace, he released the safety belts and stood up. "Chief, you have the bridge." I said to my lieutenant. "Sir, the usual tour through the ship?" "Yes" I responded "and a small side-trip to the observation deck." I left the bridge and headed to the elevator. It's always calm when you enter the hyperspace. It usually takes several hours till you reach your destination, and I always use this time to make a tour to the mess, the engines, and the observation deck. The elevator stopped and informed me, that I was on the living room deck. I walked through the long corridor towards the mess. A blue light was entering from the windows. As I walked past the windows I took a glance at the colorful maelstrom of hyperspace. At the edges of the ship, the fabric of space being bent around our ship turned violet and red and caused long trails and turbulences, while everything beyond the ship was shining in a deep blue. I was fascinated by the beauty of hyperspace since I first saw it as a young cadet when I was on my first hyperspace flight aboard the training ship of the interplanetary navy school. I shook my head and smiled while remembering these young days of mine. It has been a long time. I went into the mess. A few crewman at the entrance of the mess wanted to stand up and salute me, but I signed them with a small gesture that they shall continue eating their meal. When I reached the counter of the kitchen, the cook had already prepared my cup of tea. "Earl Grey, as usual, Sir." he said, while he smiled at me. I took a small sip of it and was confused by a little note that I didn't taste for a long time. "Are you recognizing the taste, Sir?" he said, still smiling at me. "Of course I do. But where did you get that lemon juice from?" "That, Sir, is a little secret of mine." "Well, how is my crew?" I asked the cook while leaning on his counter and letting my eyes wander upon the men in the mess. "They are all pretty well. Some hyperspace sickness as usual at the new mates, but morale is high and they are all fine. Some have a cough, but they already got ordered into a quarantine zone by the doctor. "Okay. I'll let you return to your business." I responded, thanked him for the delicious tea and went towards the exit. Next stop was the engine room. I, once again, took the elevator and went down to the engine bay, where the machinist had his sacred halls. I found the machinist behind the console of the hyperspace drive. The drive was glowing in the same colour as the maelstrom outside of our ship. It made a deep humming sound and the floor near the drive was vibrating. There was a whirl of nearly white glowing matter around the drive, that changed it's direction frequently. It reminded me of the surge at the beaches near my hometown. The machinist looked up from his work and saluted "On the tick, like a tachyon clock, Captain". I saluted him back and had a small talk about the engines. If everything was fine and if there were any irregularities. "Just the usual, Sir. The vibrations of the hyperdrive are at the upper limits, but it's all within the defined parameters." "Hmm..." I responded while taking a sip of my tea. "Yeah, the weather was better before. We are heading through some nebulas. But they are rather small, it should get better in a few hours. Contact the bridge if it gets worse." "Aye, Sir." he responded and went back to his work. I took a last glance at the beauty of the warp drive, took a sip of my tea, and went back to the elevator. When I entered the observation deck, it was completely empty. I slowly walked towards the railing and let my eyes wander over the big windows. As I reached the railing, I leaned over it and just stared into the whirling maelstrom of light in front of the ship. It was breathtaking every time. This was one of the most peaceful moments I had on this ship. I loved the colours of the hyperspace, the whirls at the hull of the ship, the glow of what might be beyond the horizon towards I could see. The ship made it's way through the fabric of hyperspace, faster than any object outside of hyperspace. It was truly an ingenious invention. And a beautiful one. I enjoyed the view from the observation deck. I emptied my cup of tea, took a seat in the armchair, read some books on my PDA and just enjoyed the peace. After a few hours, my lieutenant informed me, that he needed my presence on the bridge. I took a last glance at the colorful maelstrom outside the ship, before the elevator doors closed again and I went up, back to the bridge again. And as usual, here is a link to a version with many more pixels, for those of you having a large screen. I hope it is clear that we are zooming in into the ship, to one "street" inside it (which has a traffic jam), and what the ultimate travel actually is . 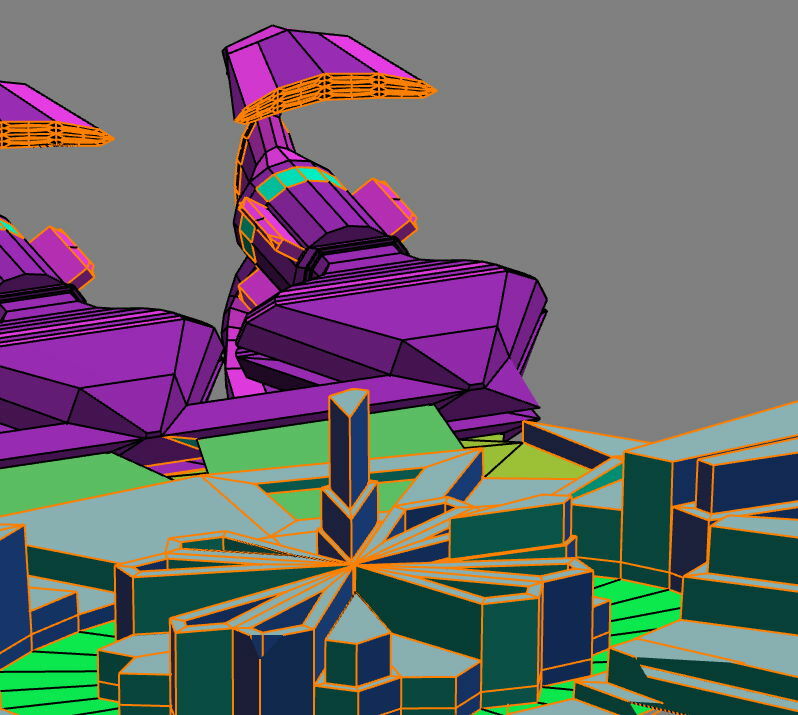 The scooter model (against the wall on the bottom-right) is imported from TF3DM, where it was posted by crashmax. I have regretfully no source for the background images of the first two panes - I had them locally. All the rest is from yours truly. Obviously, this has been completed (beyond the force field and some lights) with textures using procedural displacement bumping for creating more details. I give you: Warp Rail System 101!! The paperwork took me literally hours to complete, although it felt like weeks and no actual paper was involved at all. Then it was the awful beverage they sold me in the cantina, which it should be some sort of coffee but actually tasted like stone soup. The topping of my not-so-sweet morning cake was the little blue guy at the airlock, who smirked at me as soon as I appeared at the end of the access tube. And by smirk I mean a deeper than usual one, because somehow they were always smirking one way or another. Those little blue bastards. They were equally annoying everywhere. The deeper-than-usual smirk prompted a sour comment from me, which sort of prompted an even deeper smirk in return. I started to think that the damn blue dwarf was mocking me in a secret, twisted way, but I was in a hurry and let it go. My little ship -no more than a transfer shuttle for up to six standard sized people, really- was waiting for me on the landing pad. She had an old fashioned, boxy main hull, but the belly and the engine modules were quite voluptuous. Just like my ex-wife, now that I think about it. In the minutes it took me to get to the ship I didn't notice, but somehow a tall, bald and skinny fellow in an expensive-looking navy blue suit appeared next to the old lady and was taking a good look at her. Maybe he was on the other side the whole time, I thought. As I approached, he turned around and… well, damn him, he was smirking. The man was just as cheerful as I like them. Bloody lucky day. "Morning. You are my instructor, I presume?" "Oh yes! Today I have the distinctive pleasure to guide you as you take your first steps in the local Warp Rail System. I surely hope that you are as excited as I am!" "Superb! Did you know that our Warp Rail System was one of the few that…"
"Later," I interrupted "we must take off." "Oh, quite so. Losing our take-off window would cost you…"
Half an hour later we were floating at a safe distance from the potato-shaped station and we had an all-green and thumbs-up from Station Control to approach the WRS. I wanted to flirt a little bit with the lady on the other end of the line but the never-ending chain of stories and anecdotes from the instructor killed all lust for it. "…and then the third wave of colonist thought that the nodes were some kind of ancient living beings who…"
So I tried to get to the point in the most delicate but effective manner I could think of. "Yeah? Well, that's quite… whatever. What should I do next?" "I see! Eager to start. That is a magnificent mindset. Well then. Let us commence…"
Smooth. The man wasn't taken aback easily, I give him that. "We can now approach the first node at our end of the System. All main Points of Interest in the system have a link with the WRS. All the stations, all the planets and moons, all the main asteroid fields." "Yeah, I know that. I passed the theory test, you know." "And now you are here! Oh yes, yes. I always forget that. In my time, the theory test was not compulsory. Did you know that…?" "Yes. Probably. Passed the test and so on. Approaching the first node." I instructed the computer to fly in the general direction of the node at a moderate speed. That should do the trick. "Excellent! As you surely know, the nodes are capable of acquire all ships from all directions without problems. But you also should know, that there are some etiquette rules about it as well." "Etiquette rules? That sounds pompous…"
"Pompous you say? Well, that is quite an expression, young man!" "Yeah, well. You were saying that there are some non-written rules?" "The first rule is this: do not enter a Rail from the opposite side." "I thought there's no opposite side in this things? With the whole quantum-blabla-babble and all the woozy-doozy magic from the Makers pulling the strings." At that point the man started to laugh out loud as if he was recalling a very good joke. "That is quite the colorful description! I never heard something like that before. But yes, the System can actually acquire and allocate every single ship trying to enter the Rails. No matter how impolite the entering vector actually is!" "Quite! You see, young man, if you enter a Rail perpendicular to, I do not know… a big hauler, for instance. Moreover, in a inevitable collision course, to spice things up. Even then, the System will slow one ship or the other, even both of them, to prevent a collision. If the speed reduction is not enough, the System will alter the approaching vectors. Usually the entering ship will be allocated in a far away Rail, while the other ship will be pulled deeper to the main energy string between nodes." "That's sort of cool, I suppose." "Quite, as you say. But the point is this: we do not know how the System really works, but we do know that the energy needed to pull such a magnificent feat is astronomical. Improbably, in fact. 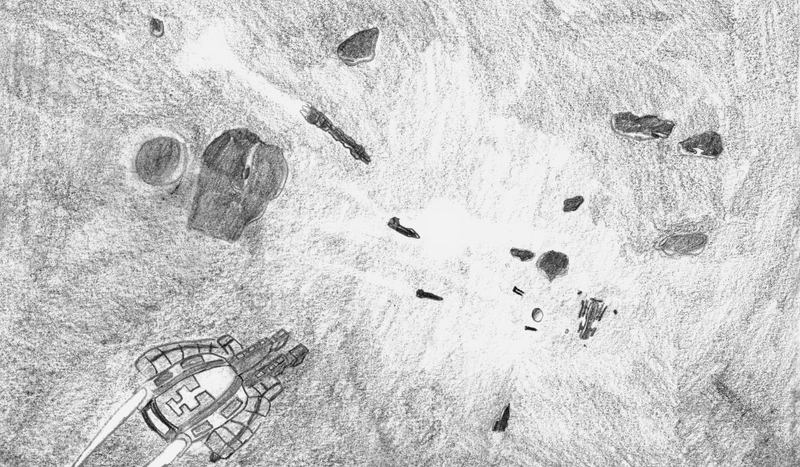 For instance, four months ago a full wing of fighters were called into action to the third asteroid field. As they operate from the second Lagrange station around the fifth planet, the travel using the System was quite long and quite fast. They were authorized to use unconventional vectors and entry points in the System. That day, the WRS-Operation Stations observed, measured and logged energy peaks from twenty-five to five-hundred percent higher than normal." "But we don't know where the System get its energy from, right?" "Exactly. And that is the actual point. We do not know if we can collapse the System by putting extreme strain on it. It never happened neither here nor in any other known system. Such a collapse would hamper the economy and life as we know it in an extremely fashion." "Yeah, we don't want to do that… So, First Rule: using polite entering vectors. Are these somehow defined somewhere or is a rule of thumb?" "Ah! Your rule of thumb would be the one to use. It really is using little more than common sense, if you ask me." "Man, that sense ain't all that common. Believe me. So, what's what with the Rule?" "The proper manner of entering the System is from a low-graded vector, slowly decreasing the distance to the main string using lateral impulse. Always bearing a point of the string some five to ten standard units in the desired direction." "Well, I can do that." "Excellent! Please proceed, young man." As the ship approached the first node in the desired polite, casual manner, the dim blue marker on the HUD got bigger. Ten minutes passed and I could see for the first time in my life, the big glowing energy ball that was a Warp Rail System node with my own eyes. And it was a beautiful thing to behold. Before entering the field of influence of the node I stopped the ship, made some selfies and wrote some stupid entries en my main social media manager. A couple of seconds later, all my hundred and twenty-three social media accounts were updated with the personal milestone. A couple of minutes later, some two thousand comments which I'll never read spammed all across the board. My SMM filtered a top-ten and flagged them for me. Surprisingly that stopped the informative mantra of my instructor. Mental note taken for future reference. As we got near the node, some other ships were doing the same. I slowed our approach to enjoy the fireworks. From the node, awesome fountains of energy arched from the node, enveloping ships of all sizes and shapes in beautiful cocoons of light and sparks. Hundreds of tiny stars playing a chaotic run and catch game with no winners or losers but the sheer magnificence of it. And a second later, all of the ships were gone. I tried to make sense of the movement, but my eyes couldn't react fast enough. One instant they were there, the next they weren't. I looked to the instructor, who was smirking. That sort of spoiled the moment. Damn him. "You cannot make out the transition. It happens way too fast for you to notice." "Oh. So it's not a matter of experience? I thought that, you know, if I tried harder…"
"I fear not. The way the energy catapults the ships in the first seconds of the journey is still a mystery to us." "But you can make out ships traveling the Rails. If you watch from afar, you can make out the single ships as little dots of energy linked to the main string. Or so they told us in the theory courses." "That is quite true, young man. You see, once a ship is in transit, the energy cocoons linked to the main energy string are quite visible. Even to the naked eye. But the first few seconds, which in the argot we call the Transition, that is not possible." "It actually is. You see, the node takes one ship, full of equipment, people, cargo and so on, and launches it at incredible speeds. In an instant." "Ooooh…" Stupid mind of mine. "Jell-O in the making!" The man smiled. Not the stupid, annoying smirk. He smiled and it was nice for a change. "Now you see it, splendid!" "What can be happening there? Any theories?" "Only pure speculation I fear. The warping part of the System is the biggest unknown of all things WRS. But this is a good time to introduce you to Rule Number Two!" "Etiquette Rule Number Two incoming!" Wait a minute. What the frak am I doing? Enthusiasm can't be contagious, can it? "That is the right spirit! Number Two is a little fuzzy on the edges. You see, when you enter a Rail behind other ships, the speeds usually vary quite a lot. For instance, we are approaching the node slowly, as it always should be for a beginner, but we are being followed by three other ships. And they are coming quite fast." "Yep, three bandits at our six closing fast. Is that… uh, impolite?" "And therefore the fuzziness. In my humble opinion, this is even more impolite than unorthodox entry vectors. You see, being impolite regarding rule Number One doesn't upset pilots, because, well, the System handle it all, but…"
"Pushing other pilots from behind is getting close to harassing them. Because the first seconds of the travel are… uh… quite weird and coming out of that weirdness with one or more ships passing you closely and fast is sort of annoying or terrifying?" "Quite. I am happy to see a young man such as you getting the fundamentals so easily. I am very pleased!" Despite of myself I smiled. Oh hell, why not. "So I should be nice to the System and nice the other pilots. Check!" "Very nice, indeed. Please proceed now to the first node, steady and minding your fellow travelers!" And in we went. Nice and steady. I must confess that it was exciting as much as frightening. The energy splash from the node felt like a cold shower. It wasn't actual cold, of course, but the expectations raised the hair on my neck and arms. Then the tiny stars danced before my eyes, just for a second. After a flash of pure light we found ourselves traveling at improbable speeds alongside other ships, and alongside hundreds of thousands of energy dots, following the almost magical path of the main string, beholding the beautiful fountains of energy left from ships leaving the System. It was like daydreaming in a world of stillness and awesomeness. We traveled in the far lanes of the System, maybe eight or nine lanes further than the closest one to the main string. I took a look outside the System, where the nearest asteroids passed fast and the celestial bodies glowed eerily in the darkness of deep. I could say that the instructor liked his job quite a lot, because he immediately sensed when I was speechless and in a state of deep awe. Why I know that? Well, because he let me alone as much as I needed. A sort of felt ashamed of my previous behavior to him and tried to be a nice customer for the rest of the ride. Which he graciously accepted as a silent compliment by being… well, quite himself. "I must say it: the holos and the explanations didn't make justice of the sensation. At all!" "I must confess that it is a personal pleasure to sit here and watch all my customers react quite the same way the first time." "It is really an unique experience. So! Is there a Rule Number Three out there waiting for an eager rookie?" "Ha! We have a learner in our midst! I knew it. I confess that the rough start was a little let-down for me, but now we really are getting on the same wavelength. Exhilarating!" "Yeah, sorry… it was all my fault. The coffee wasn't coffee. The blue guy at the entrance was smirking at me and I really don't like that…"
"Oh they really like to do that. But do not trouble yourself! We are here to enjoy the magnificence of our Warp Rail System!" The man was being plain bright at that point. Then I knew: that was a dream-job for him! "All right, good sir! So is there a Number Three for me?" "Indeed it is! This section of the System has a length of thirty nodes. Usually you do program your desired exit node from the beginning. Letting the computer do the exit is the standard way but, for learning purposes I want to point out that you should do it yourself now and then, specially if you do it between nodes." "Why is that? Safety issues?" "Oh well, the System is safer than everything else in our lives. The actual accident rate related to the System is almost zero. There was one case one time some twenty-odd years ago. But the technicians never reached a conclusion about the causes. The authorities and the insurance companies of the pilots involved fought more than ten years. In the end all shared responsibility because nobody could prove otherwise." "That must've set some sort of precedence, right?" "Indeed. Anyway, the point is that the System is almost one hundred percent safe, which means that you will always leave it-and that means the influence zone of the System itself-safely. You cannot exit the Rail and smash an asteroid, or another ship. The System will place you in a safe exiting vector, at a safe speed. What you do at this point…"
"Let me guess: Etiquette Rule Number Three." "Indeed! Rule Number Three states that the pilots exiting the System should maintain the vector given by the System for half a minute at least. A whole minute would be nice. Two or more being pulling tickets for the nicest pilot of the system!" "Gotcha. You shouldn't disturb fellow railers while exiting." "Railers? That is a wonderful, invented word. I like it!" "Uh… thanks! So, should we take an automated exit at a node or a manual one between nodes?" "Since you are under supervision of an authorized instructor I will suggest a manual exiting at your discretion. If you actually are up for the challenge, that is!" "You can bet on it!" And there I went. All green behind the ears and trying my first manual exit. It was exhilarating. While I prepped the ship I wondered if the sensation would be the same as entering the Rail. "So, I'm ready. Is there anything else I need to know before I pull out?" "Since we are already traveling the furthest lane of the System you can slowly pull out. Later we shall try changing lanes. Go ahead!" I twitched the control stick ever so slowly to the right. The lane had a considerable buffer on the sides. Then I sensed some invisible resistance. I forced the controls a little bit and then we were free. It felt like swimming out of the first storm of bubbles when you jump into water. Only that instead of bubbles there were energy dots splashing away from the view. Then there was only darkness until my eyes adapted to the new situation and the stars started to appear. "Wonderful! Well done, young man!" After we observed the Rail from afar some minutes, enjoying the view and making some light conversation about history, we went in again and the instructor guided me in "The Art of Lane Dancing", as he colorfully described it. There were no more etiquette rules for me, but the experience was quite an enrichment for me. The lessons went on just over half an hour and from there we flew back to the station to call it a day. After following procedures, we stood by the ship and said our respective goodbyes. Then the man turned around to leave. While I was watching him leave I realized that I didn't knew his name. The contracted company filled the forms just with some sort of long number. The man stopped and looked at me with his now not-so-annoying smirk. I closed the gap and reached out my hand. "I'm Jonas. I just want to thank you again for the wonderful experience." The man smiled. A bright, sincere smile that radiated warmth. "Jonas. You know, young man. I believe that this is the first time that someone tells me his, her or its name. I thank you for your kindness!" "We could, you know, take another trip out there sometime. It was quite entertaining!" "Would you like to? That would be marvelous. There is so much I could tell you about the System!" "Shiny! So give me your card, your tag number or something. I'll get to you when I have time. We'll check our schedules and see if we can find the…"
The phrase sort of died in my mouth when I the man started to laugh. "It may sound strange to you, but I do not possess any manner of identification." "It seems so... Let us do this the other way around. I will reach out when I find the time, yes?" He smiled the whole time. Then he put his right hand on my shoulder and I could swear that, for a moment, his pupils flicked with a soft light. In that moment I thought that it must've been some awkward light trick and let it go. "Fine, fine. I'm pretty much open to suggestions right know. My work schedule is adaptable." "Excellent! Well, my new friend Jonas. Until then, take care!" "You too, eh… what was your name?" "I did not tell you my name, actually. Now I am being the impolite one!" "It happens to me all the time. Don't you worry!" "All my acquaintances call me Reilen. It is a short form of my actual name, if I must be completely sincere." "Maybe you could tell me the long one some other time, then." "It will be my pleasure. It is a very, very long and old name." "Intriguing. Very well, be seeing you, Reilen!" The man turned around again and I did the same to close the outer hatch. The whole process couldn't take more than ten seconds, but when I turned my back to the ship again, Reilen wasn't there anymore. So I've been working on a tank for the past couple weeks and although it's not strictly travel I thought I might share the WIP as an LTFC entry with a little blurb. - Main guns have 25 degree independent horizontal traverse, 15 degrees elevation and 6 degrees depression. - Resistance to extreme heat, cold and weather effects with shield online, reduced resistance while shield is destroyed/offline. The Bariq class railgun tank was designed in 4263 by The Imperial Military Development Corporation (The IMDC) to fill the role of main battle tank within the empire's military. Its fearsome main guns can be fed different amounts of energy based on the target and range, allowing for diverse combat engagements with only a single vehicle class. The secondary autocannons swivel independently from the main guns and are able to track fast moving aircraft and ground targets, providing a secondary means of offence and preventing the tank from being surrounded without being able to defend its self. The armour is standard carbyne plating providing incredible effective armour while remaining light compared to older materials. Prototype Electromagnetic Repulsion armour exists on the front hull of the tank, allowing the ERA to be re-used without having any manual reset. Three crew control the various systems of the tank aided by an additional sentient AI crew, who is able to largely assist with many functions within the tank as well as allow communication through the biotech military implants of the crew. Stripped versions of this vehicle may be used as all terrain hazardous environment transport in both civilian and military positions where it is deemed safe not to have weaponry. Pencil on paper. More or less based on two LT screenshots, as you can see. And now, for the results of the April 2017 "Travel" competition! The first place winner is: HowSerendipitous, for his entry The Aurora-class Starliner - with a score of 92.33!! CSE with a score of 82.33 for his entry The Ultimate Travel! Cornflakes with a score of 77.67 for his entry A Single Photonic Pulse! Surprisingly well-written, didn't expect something as poetic from somebody like Cornflakes. I could imagine a progressive metal sound under it. Well done. Very stylized poem. It was interesting to read, though a little unclear... but I get the feeling that was the point. I liked it. That sudden flip from a third-person to first-person narration should not be done ever unless your goal is to confuse your readers. Other than that - solid writing, but lacking in direction. A good read. Only advice here is, if you're telling the story from the protagonist POV, it might help to give the reader a bit more exposition so they can get into the character. A relaxing tale of a captain that has disturbingly little to do. Unfortunately, it felt uninspired: there was nothing to drive it along. Regardless, the writing itself was rather good, and it was still entertaining in its own right (despite some misplaced speech tags near the center and unusual point-of-view choices). This one greatly amuses me. Well done! You managed to double-squeeze the topic into it. The images look good too! 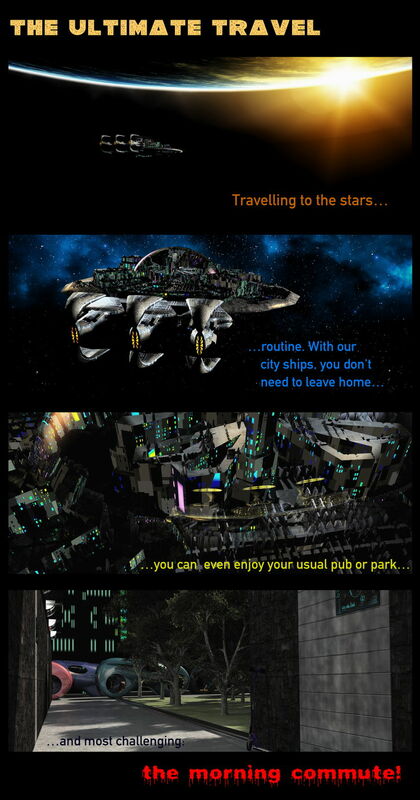 Very nice, and a thumb up from me, although I must admit - I don't think LT will have city-ships. The final punchline is good! The sense of 'zooming onto the street' is not there, but it hardly needs it. Procedural displacement bumping clearly shows its limitations when zoomed up closed, but looks very, very good from further away. All-in-all, a nice entry. Great job! The comic reads as an advertisement, except for the joke at the end. It made me wonder what I just read. Usually making secondary characters laugh at even the most primitive main character's jokes or approve of what he/she says is either extremely creepy or extremely dumb, and is usually the reason the entire work is rejected outright. Here, however, it kind of works due to the instructor being (as I understood it) a robot/hologram/whatever designed by the Makers of the Warp Rail System to teach newcomers, so a certain creepy vibe fits it...but because the creepiness isn't shared by the man character, it fails to be as convincing as it could be, unfortunately. On the plus side, the story is very detailed, visual descriptions are rich, and it's as LT as it can get! While the story was good, it was too hard for me to follow who was saying what after a while. As the instructor put it, "I confess that the rough start was a little let-down for me", but by the end it was a fun romp through the magic of warp lanes... with an unusual twist at the end I'm not entirely sure how to process. Is Reilen a god? We may never know. A new bar is set. Well assembled! I think my favorite part was probably the "integrated biosphere"; not something people normally remember when they think about ships. At any rate, the biggest thing I think you could improve would be the animations, but I think you know that already. It's a nice tank, but it has very little to do with travel... or Limit Theory. I had to take points off for that, and I wouldn't be surprised if the other judges did the same. Thank you for entering, at least. Certainly original. The relationship to the topic (the travel!) isn't well-shown, though. Liked all the little details. A fine looking tank. Sadly, as you said yourself, it doesn't fit exactly in the topic of the contest. Also, AFAIK, LT won't have tanks. Somehow comes across as really nice, instantly gives off those LT vibes. Ship model needs much more work, though. It's very hard to convey depth in a space setting while limiting yourself to pencil; Regardless, you did a recommendable job. I'm not entirely sure what's going on in this image. I see the ship, yes, but beyond that... the rest is a blur to me. Are those asteroids? Damaged ship pieces? It's difficult to tell. I feel like you did this in a hurry... but that said, I do like it all the same.